Lens Color black/blue/silver/green/pink/yellow Size Lens Width: 5.5cm(2.16inches) Lens Height: 4.9cm(1.93inches) Frame Length: 14.4cm(5.67inches) Bridge Width: 1.6cm(0.63inches) Arm Width: 14.6cm(5.75inches) Package 1x Sunglasses 1x Soft Glasses Cloth 1x Screwdriver 1x Exquisite Packaging Carton 1x polarizing test cardboard 1x brand cardboard 1x latch catch wearPro wayfarer sunglasses for Men All wearPro sunglasses are made from first class materials. Fashionable style and first class quality is what we convey to our customers. wearPro Retro Polarized Sunglasses for men Features Lightweight and durable Scratch resistant Of course, the frame and nose supporter is made from skin-friendly materials. Aluminum and magnesium alloy arms and synthetic resin frame constitute a sunglasses with light-weight feature and enable you a long-time wearing without fatigue. 100% UV Protection Filter out 99% of reflected glare without haze or optical distortion. Protect your eyes and enjoy a high clarity vision more comfortably. We also provide a polarizing cardboard for you to test the polarized lens of our wayfarer sunglasses. 2017 Brand New Italian Design This 2018 brand new Italian designed retro polarized wayfarer sunglasses for men. Combine retro outlook with modern high-tech materials. Low-key appearance but show your high-end taste, add another point to your charm. Suitable for Outdoor Activities Whether you're into driving, fishing, baseball, golf, or you're a Kurt Cobain nostalgic, a fancy motorcycle rider or a club and party follower. All could use the benefits of the polarizing effect and the attractive appearance of this retro vintage wayfarer polarized sunglasses for men. POLARIZED HD VISION LENS - 100% UV400 protection coating, blocks 99% harmful UVA&UVB rays. Reduce glare reflected off of roads, bodies of water, snow, and other horizontal surfaces. Restore true color, eliminate reflected light and scattered light and protect eyes perfectly. Polarized sunglasses cut glare and haze so your eyes are more comfortable and you can see better. The wayfarer sunglasses designed for driving, running, fishing, racing, skiing, climbing, trekking, etc. 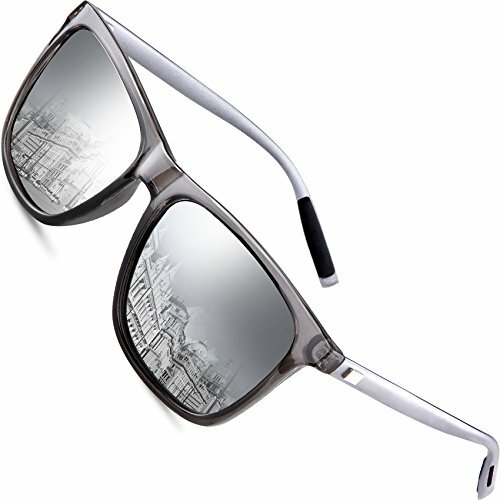 ALUMINUM MAGNESIUM METAL ALLOY ARMS AND REINFORCED METAL HINGES- Aluminum &Magnesium Alloy makes the arms of the sunglasses strong and super light. These polarized retro wayfarer sunglasses for men were also constructed with reinforced metal hinges to ensure durability and avoid breakage while engaging in sports and recreational activities. VINTAGE INSPIRED INTEGRAL FRAME DESIGN-Combine retro outlook with modern high-tech materials. This fashionable retro vintage sunglasses design is the most popular style of sunglasses selling on Amazon. This classy and vintage polarized sunglasses for men is designed to suit both men and women as high fashion accessory and daily wear. PORTABLE AND STURDY STORAGE BAG -We provide a portable and soft storage bag as well as a lens cleaning cloth and a small screwdriver with both plain and cross head tips for any adjustments if needed in the future.